The NHL can’t be pleased that this kind of bewilderment has emerged as a central theme of the centenary it’s celebrating this year. What the league would prefer, I’m guessing, is for a magical intervention whereby all goalie interfering would cease, and thereby all the complaining, too, that players and coaches and fans and commentators are doing. Failing that, NHL general managers last week took a run at refining the protocol for reviewing purported cases of goalies being jounced, jarred, and otherwise jolted. The GMs want to take the decision-making on what’s happening in and around creases out of the hands of referees on the ice and pass it over to the league’s all-seeing hockey operations headquarters in Toronto. That’s now been approved, apparently, and will be the way things are done starting this week. 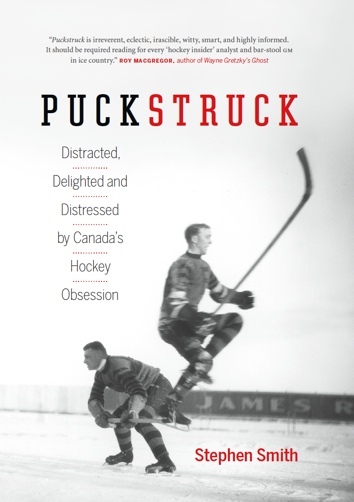 Since this is such a big anniversary year, maybe the NHL should be doing more to commemorate the history of its skaters crashing, inadvertently or not, into its goaltenders. In that direction, I’m offering up this photograph, from December of 1937, when the Montreal Canadiens met the local Rangers at Madison Square Garden in New York. The game ended in a 2-2 tie. Seen here is Montreal attacking the Rangers’ net in the third as Pit Lepine buffaloes past New York goaltender Dave Kerr on the way to scoring Canadiens’ second goal. 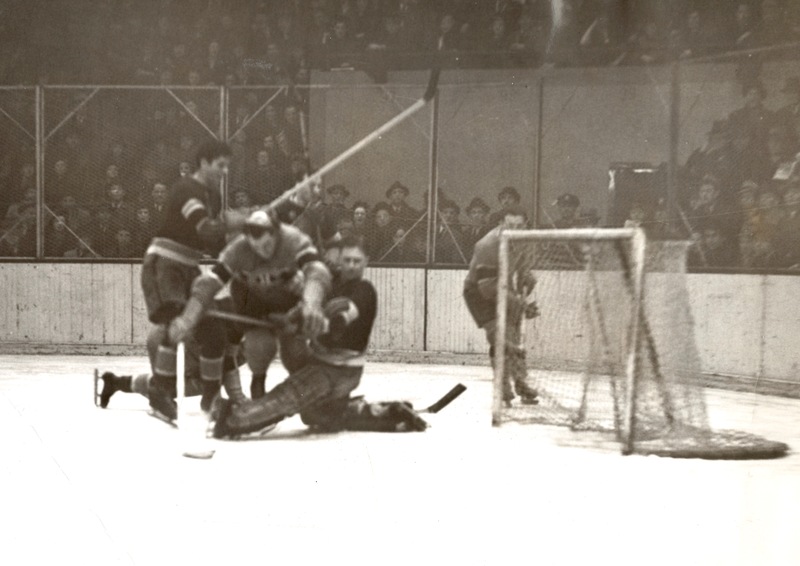 Babe Pratt is the Ranger defenceman to the fore, with stick raised; the Montrealer partly obscured by the net is possibly Toe Blake, who assisted on the goal. I don’t know if there was a review — none of the newspapers accounts I’ve consulted mention any. “Lepine poked the puck into the cage,” is the most detailed account I’ve seen of the goal. If that is Lepine. Another item I’ve come across from later on this same season might cast some doubt on that — maybe. Look at the head of the player crashing past Dave Kerr. The resolution of the image isn’t so sharp, but you can see that there’s something going on up there. Assuming that’s not a monkly tonsure, then he’s probably wearing a helmet. If so, it doesn’t look like a wholly protective model, sitting as it seems to be mostly to the back of Lepine’s head. The Detroit Red Wings experimented with a head-protector like that earlier in the 1930s, so it could be one of those. So is this maybe Toe Blake crowned with shoulder-pads we’re viewing here? I guess it’s possible too that Lepine could have taken a page from his winger’s stylebook and fashioned his own colloquial headgear. Either way, whoever it is, and whatever he’s wearing, Dave Kerr doesn’t look too impressed. That’s clear enough.